I believe there is a big difference between flying on a short flight and a long flight with a baby… so I want to be clear that this was my experience with a solo one hour flight. I still learned a lot on these flights that I will be using on my longer flights in the future! You can find my first big flight experience by clicking HERE! The first thing I did to ensure a successful flight was to arrive with enough time to not be stressed out about check in, security and finding my gate! I flew with Westjet and found flying out of Calgary they were absolutely wonderful, flying home they were fine, but nothing to write home about. I was meeting my dad, uncle and brother in Vancouver and fortunately my dad brought a few things from Grandma and Grandpas house so I didn’t have to being everything… I still ended up with a huge suitcase, a backpack, diaper bag, stroller and car seat that I had to deal with! I couldn’t believe how much stuff this little one required… but I realized that you need a certain amount of stuff no matter how long you are going. 1 week vs. two weeks doesn’t actually mean that much more! You get two free baby items with most airlines, that I fly with, and what I realized was that you don’t have to gate check them both, or you can… whatever you want to do! When there were two of us we gate checked the car seat and umbrella stroller. Because it was just me, I was able to check in the car seat with the giant suitcase! They provided a bag for it and tagged it all up… easy! FYI: My packing list will be in the next post! So far in my flight experiences with a baby I have only had to wait with everyone else to go through security once, otherwise I have been put in an express line… so nice! I like to be nice and prepared for security so I don’t wear a belt, usually I wear Toms so I can slip them on and off easily(usually they let me keep them on), no extra jewelry… seriously make it is easy on yourself! With a baby you are allowed liquids, just be prepared for them to swab them. I had all my liquids (basically a food pouch and a Sippy cup with water) easy to access and ready to go! On my way out of Calgary apparently I set off some alarm with one of the food pouches I brought, so I ended up getting a very thorough search! Talking to the very nice security guy, he mentioned that often the food pouches do set off extra alarms (maybe because they have liquid, metal and plastic in them?). He did say if there are some less than 100 ml that they don’t need to swab them… if I find these I might pick some up, but on the way home I had the same brand of pouch and had zero issues! In Vancouver I discovered a family bathroom… wonderful! It was huge so I could roll the stroller in and have plenty of room. There was also a little bench where I could nurse baby H easily. In the airport I made sure I had a blanket with me, to put down on the ground so that she could roll around and play before we left (naturally she did end up on the airport carpet a bit, but what are you going to do?). I also always grab a bottle of water for the plane, which was great because there was no way I was going to be able to put a tray down with her! It is so nice being able to get on the plane first and get all settled. I believe the airlines really prefer you do this as well, so they can go through all the safety stuff and make sure you are good to go! Also I should add, as we were boarding one of the lovely attendants helped me out by holding H while I folded up the stroller (there was almost a fight amounts the gate agents about who would help me! Haha). Being a short flight I made sure I was in an aisle so I could walk around if I wanted… I am a window girl usually! Being that it was such a short flight I changed H prior to boarding the plane. I put my diaper bag in the seat in front of me with easy access to toys (although I was correct in thinking she would be more interested in the people on the plane!). Also I made sure I had a little bag of baby puffs and crackers in the outside pocket of my diaper bag. H is happiest when eating, just like her mom. I have never had issues with her ears, but do make sure she is sucking on her pacifier for takeoff and landing. Going to Vancouver H was a bit excited so she spent most of it jumping on my lap, for an hour not a big deal! On the way back she slept for most of the flight… giving me a dead arm! All in all it really was a very easy experience… being prepared and knowing it was only an hour flight… I had confidence I would be able to handle it! If you are travelling by yourself and have an issue just ask for help! People are HAPPY to help! Great ideas more parents would read this. Great tips! We’ve flown with our kids since they were babies but we always had 5-13 hour flights so I am a little jealous that you got to take a 1-hour flight with your sweet baby! 🙂 Those family restrooms at airports are so wonderful! I totally agree that being able to take a quick flight is lucky… 10 hrs drive vs 1 hr flight… Yah not a difficult choice for us!! Great read! Saving this for when I have kiddos 🙂 I love to travel and doing so with a kid sounds terrifying! As long as you are somewhat prepared it is totally possible… I’m still terrified, but a healthy does of fear has helped me be prepared for the worst I think! I have flown solo with a baby or a baby and older children more than I have travel with my kids and the kids with me! It is like second nature to me but still can be so difficult. Each age brings new challenges. This is a great post about what to expect and pack for. Thanks for sharing! Thanks for such positive feedback! I have traveled solo with a baby exactly once, and it was a long flight. Your tips are spot on. For a longer flight, I bought all new toys, snacks, books etc., so that whenever my little one got fussy, I had a trick up my sleeve. I didn’t even need them all, but it gave me piece of mind, knowing I had a plan. I feel so horrible when I look back and think about all the time I secretly rolled my eyes at a baby being on board! Parents are doing their best! 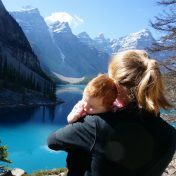 Such great tips for flying solo with a little one! You go!